India is trying to move away from cash transactions and it is trying hard to move towards a cashless economy. Every citizen of India is trying hard to adapt to these changes but the fact is that the technology and the regulations play a bigger role in this case. A person needs a quick technology which is easy to understand, this will eventually promote cashless transactions. The government also contributed a lot by announcing several new incentive schemes which encouraged people to adapt to the cashless transactions. There is certain scenario when a person can't pay through a debit card or a credit card and in such a case he needs to transfer the money to someone's bank account. Digital wallets definitely help a lot in these case but they are not widely accepted. In such a case, the only option that a person is left with is to register the person as a beneficiary in his savings account and transfer the money to him. But the problem here is that the process can take long. Banks like Axis Bank has a provision where a person needs to wait 8 hours before the transfer can be made. SBI had always been a leader in the banking industry and it is one of the largest public sector banks in India. 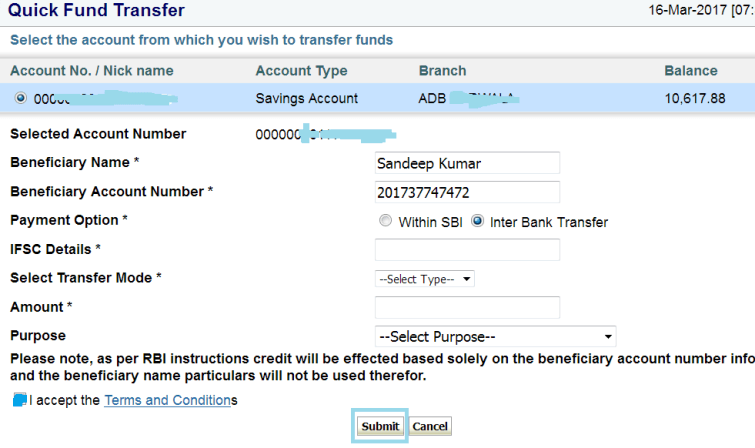 SBI recently introduced something called as Quick Transfer. The quick transfer is quite helpful for the transfer procedure as it eliminates the need of registering the user through 'the add beneficiary' process. This definitely saves time and at the same time, this also helps in making the process quick because the user doesn't need to wait for the registration to complete. The user can transfer the money immediately without having to wait for an hour. The quick transfer can be done through the application as well as the website. Both the channels are really convenient to use and it just takes about a couple of minutes to transact through these mediums. How to Do quick money transfer in State Bank of India? 1. 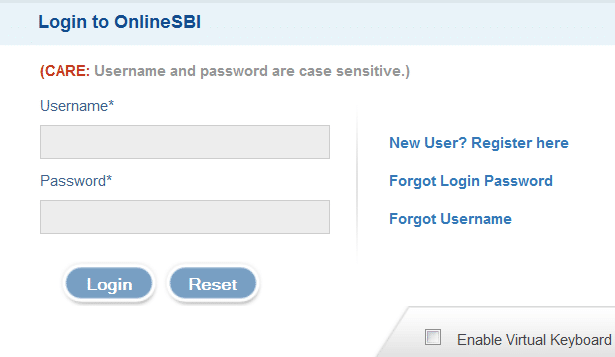 First login your account at https://www.onlinesbi.com/ by entering username and password. 2. Now click on 'Payment/Transfer' tab from main menu. 3. Now from list of transfer services, click on 'Quick Transfer'. 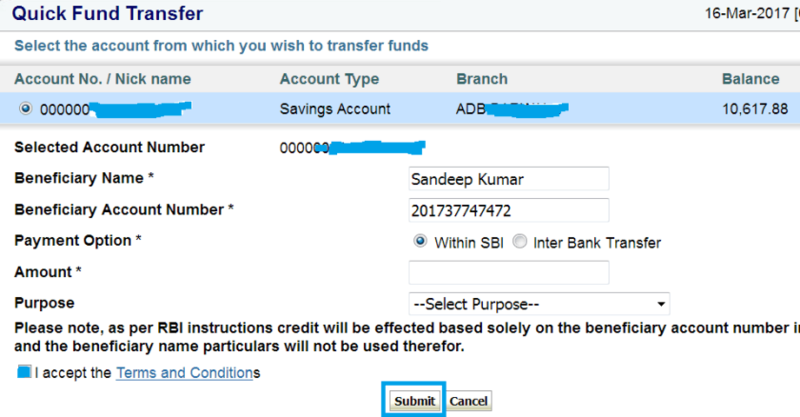 a) Within SBI: To do quick transfer SBI to SBI, just you have to enter Beneficiary name, account number and amount. In payment option select payment option 'within sbi' and select purpose. Accept term and conditions, then click the 'submit' button. Finally enter one time password sent to your registered mobile number and complete the transaction. b) SBI to other Banks: To do quick transfer sbi to other bank, select payment options 'inter bank transfer' and select any purpose. Enter Name, account number, amount, IFSC code and click the 'submit' button. Finally complete the transaction by entering otp sent to your mobile number. The transactions that can be made with Quick Transfer has been limited to Rs 10000 per day per user. A user can either transfer the sum of Rs 10000 to a single user or he can make transfers to multiple users but the cumulative sum of the transferred amount cannot exceed Rs 10000. The limit is kept for the security reasons. This also ensures that in the case of any fraud, the loss is limited to Rs 10000. To transfer money to other bank account, the charges applicable on Quick Transfer are same as the charges of NEFT. The NEFT charges applicable on transactions are Rs 1.00 plus Good & service tax. The charges would be deducted from the account of the person who is transferring the amount. No amount will be charged upto amount rs 1000 for quick transfer using IMPS mode. Rs. 5 + GST will be charged for amount above rs. 1000 for quick transfer using IMPS mode. If beneficiary account is maintained with SBI, as soon as the amount is transferred from the bank, the amount reflects in the account of the person to whom it has been sent. Article Updated: 4 March, 2018. I have made a Quick Transfer to ICICI Account. But I have entered the wrong Account number. Could you lease help me out? how to do quick transfer one sbi to another sbi. Dosto......SBI ne quick transfer ka option Website se hata diya hai. Website se avi quick transfer nahi kar sakte. Lekin......SBI Anywhere mobile application se avi vi aap quick transfer kar sakte hai. It is SBI responsibility to update customers if any changes in services removed or revoked. You can do the quick transfer from SBI ANYWHERE APP from android phone. The quick transfer is not shown what is the reason is it removed from sbi or sight is under maintenance plz help me let me know the problem.Whats the hell is going on, nobody is replying from sbi. Noo quick transfer available from 3 days.why? No quick transfer option is available now in the option. ...how can I transfer money without adding beneficiary. ..to other bank? It is very surprising that SBI did not offer any comment on the problems of their consumers as commented by them regarding Quick Transfer.For the last so many days i am also unable to see the Quick Transfer option while logging Sbionline personal banking. Would SBI Officials be able to spare some time for their consumers to resolve this issue. Quick transfer option is active in SBI anywhere app..
sir last three days onwards quick transfer option not showing why is there any technical problem then where is next solution against quick transfer.I am facing the same problem. My account doesn't display quick transfer option. Same is the issue with my friends too. quick transfer option is not showing under payment and transfer. For transferring money above 1000 Rs in other bank then what will be the GST amount?? Please try after some time... Its may be a server issue..
Quick transfer limit 5000.So if I want to send 9000 then I hv to send in two instalments 5000 & 4000 separately. Is it correct please tell me. SBI increased the limit... You can send upto 10000 rs... You can send 9000 in one instalment..
sir if i transfer 7000 rs to same bank holder so, what will be charge in quick transfer. I don't know IFSC code... Then what to do? Now you can transfer upto 10000 rupees/day in sbi through quick transfer mode.sbi is doing a commendable services compared to other banks. I also find sbi apps.and net banking system the best easiest too. Thank you sbi for your easy and friendly online transaction services. This quik transfer applicable only for SBi banks or we can transfer fund to other bank also? Moderator please pass these comments on.... This is the real required feed back for sbi... You would do a great service to mankind bhi being kind enough to pass on these "very much required feedback"
Is this quick transfer not allowed for nri account? how to do quick transfer using android app. Just download sbi anywhere personal app from google play store. After registration you can use it for quick transfer. Kindly upload the minimum of 25,000/- Rupees,am not able to transfer more than 5000/- per day. I hope you will solve this problem as soon as possible. During quick transfer if we wrong spell the beneficiary name. But correct acc. No. Then what will happen ? Thanks for information. First time i introduced to 5000 Limit. Laxman quick transfer ki limit ₹5000 hai. ₹5000 se upar wale transaction quick transfer se nahi hote hai. Kindly increase the limit upto 10000 rs sir. Please tell me the timing of quick transfer for imps to other bank. After transaction with quick transfer, if we want to check transferd account number, it's not visible only reference number it showing,how can we check account number. This is the good step.Please upgrade the amount minimum 50000 Rupees, Now a days any emergency what we can do with 5000 rupees.